A. You must give way to traffic on your right. B. You must not turn to the right. C. You may turn to the right. Correct. It means you must not turn to the right. Compulsory stop. All vehicles must stop and give way using the give way rules. A stop sign will usually be painted on the road showing you where to stop. Give way: Slow down and be prepared to stop and give way to all traffic if there is any danger of a collision. There's a roundabout ahead. Give way to your right. This no entry sign indicates you cannot drive beyond it as it may be the entrance to an exit-only driveway or a one-way road with traffic coming towards you. You must not go straight on from the right lane; you can only turn right. This sign means that traffic travels in two directions. You might see it after exiting a motorway or dual carriageway or after a one-way street. This sign means you must not turn to the right. You might see it to prevent you from turning the wrong way into a one-way street (along with the no entry sign above), or where it would be dangerous for you to make a turn across oncoming traffic. Whereas this sign is the opposite and means you mustn't turn left. Again, this could be to prevent you from turning into a one-way street. Traffic can only proceed in the direction of the arrow, in this case left. This might be seen if the lane only turns to the left. 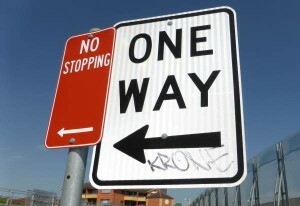 You must follow the direction of the sign as it's a one-way street. You can park on the left or right of a one-way street, unless there are instructions not to park or stop like this. Keep left unless overtaking. You will find this sign at the beginning of passing lanes. Speed limit signs tell drivers the maximum legal speed for that stretch of road. Where there are no speed limit signs the limit is 100kph unless there are street lights, in which case the limit is 50kph. For speed limits in New South Wales, click here. 60 km/h is the speed limit in this area. Speed limits are different to advisory speeds as they set the maximum speed you can drive in good conditions rather than a recommended speed. For more on speed limits vs advisory speeds, click here. Around schools there are likely to be school zones with a reduced speed limit during certain hours (the hours children are travelling to and from school). You must obey the speed limit during the times displayed. In residential side streets watch for local traffic zones which will be less than the usual speed limit. Advisory signs with distances warn of a hazard and for how long that hazard is in effect. Drive any distance out of the city and you'll probably see something similar to this one which warns of kangaroos on the road. There might be wandering stock on the road ahead. Take care, especially at dusk and night. Narrow bridge ahead. Watch for pedestrians on the bridge and wide loads coming towards you that could be too wide for you both to drive across the bridge at the same time. There may also be a supplementary plate indicating who has priority over the bridge. Slippery when wet. Rain can cause the road to be much more slippery in areas where a high build-up of oil, tyre rubber and road grime occurs, and there is a risk that you might skid if you are going too fast for the conditions. Slow down and take care. This sign indicates that trucks may be pulling out from side streets. You may see these signs near industrial areas, for example. Road workers may be working on the road and you may be instructed to stop. This sign might also be in orange. Road repairs can cause the road to be slippery, and you may come around a corner to find a traffic controller with a handheld sign directing traffic, therefore be prepared to stop. If there's a worker or traffic controller with a stop sign directing traffic then you might see this sign. This sign can also be in black and yellow for night time. 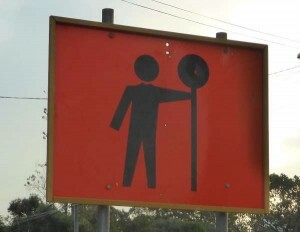 If a lane ahead is closed due to road works you will see a sign like this. It shows that the left lane is closed, so move across to the middle or right lane in time. If there's a reduced speed zone then you must slow down and obey the posted speed. Railway level crossing with flashing signals ahead, slow down, drive carefully, and be prepared to stop. This article explains how to deal with railway level crossings. There's a railway level crossing ahead. 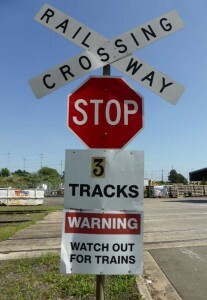 Railway level crossing signs are a crossbuck showing railway crossing followed by other supplementary signs such as Stop, and the number of tracks you have to cross. If there are red lights flashing at the crossing you must stop until the light stop. If the lights continue to flash after one train has crossed it means another train is still coming. If there's a stop sign you must stop and check the tracks are clear before crossing. For intersection rules, see this article. You are approaching an intersection and traffic may enter from the side road. T-intersection ahead. If you are on the terminating road, you must give way to all vehicles approaching from your right or left. This sign is for a crossroads ahead and you may need to give way at the crossroads, depending on the signage. Advanced warning of an intersection where you have to give way. The intersection might be concealed. Slow down and be prepared to stop to give way to other traffic. Windy road ahead: there may be bends that are sharper than you anticipate, so the safest way is to slow down. The first curve will be to the right. A sharp depression in the road can bottom out your suspension in extreme cases if you are going too fast. This can not only damage your car, but could cause you to spin and leave the road. Be prepared to slow down if necessary. It may also conceal other vehicles coming towards you so take care if you want to overtake another vehicle. There's a crest of a hill ahead. Be careful if you are overtaking as you might not be able to see vehicles coming towards you that are the other side of the crest. This sign indicates a sharp right hand turn. You may need to slow down, especially if it is wet. There's a curve to the right with an advisory speed of 35kph in dry weather. This would make it quite a sharp curve, so be prepared to slow down, especially if you are a learner motorbike rider as there could be other hazards such as wet road markings or gravel in the road. You are currently driving on a divided road and the road will join another road with traffic heading in the opposite direction to form two-way traffic. When the two-way road you are on is about to become a divided road you will see this sign. There is a steep hill ahead. You should slow down and change down one or two gears to allow your engine to take over some of the braking. Be careful you don't suffer from 'brake fade' where your brakes stop being effective. If you notice this happening, pull over immediately and let the brakes cool down. If the sign was pointing upwards then it would be a steep incline which means you should change down a gear to maintain your speed, especially if driving a heavy vehicle or towing a trailer (see this article for our complete guide to towing). Road narrows ahead, slow down and prepare for a change in traffic conditions. 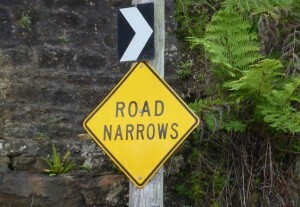 Another way of indicating that the road narrows is a sign like this. In this case there is also a chevron to the right showing that the road bears to the right. There's a road hump or speed bump ahead. Driving too fast over these can damage your suspension. This article explains more about pedestrian crossings and driving around pedestrians. This area may have children present, for example, near a school, play area, or swimming pool. Be careful and be prepared to slow down if necessary. Kids have less road sense and could run out in front of you if distracted by something the other side of the road. This area has been identified as one where pedestrians are common and may be crossing the road. It could be near shopping centres or other public amenities. Pedestrian crossing ahead, slow down and be prepared to stop. On temporary barriers and at road works you might see a more simple direction arrow and the word Pedestrians indicating that pedestrians should follow this sign around the works. It doesn't indicate a crossing, though. This is an area with more than average bicycles so be vigilant when looking for them as they can be difficult to see. If the lights are not working, or the amber is flashing you treat this intersection like you would any intersection with a stop sign. Supplementary plates might give extra instructions. If you are driving a bus and you come up to a traffic light showing a white B then you can proceed through like with a green light. The same applies for a tram with a white T. Other vehicles must wait for the green light. This article contains more information about parking. 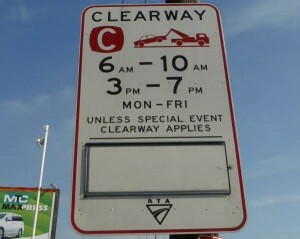 A clearway is a section of road where parking is prohibited during certain times, and your vehicle will be towed if found stopped there, in this case between 6-10am and 3-7pm, Monday to Friday. There might be supplementary plates or panels, as is the case below, that give other instructions, for example that if a special event is on then it can be a clearway outside those times. Vehicles are not allowed to stop at the kerb except in a medical emergency. Between 6am-10am Monday to Friday this transit lane requires that you have at least two passengers in addition to yourself, or you can use it riding a motorbike. Lanes could be T2 which would mean the driver and one other passenger. Pets are not classed as passengers in a T2 or T3 lane. Only vehicles carrying a disable person and displaying a mobility parking authority may park in this area. Other vehicles might be ticketed or towed. 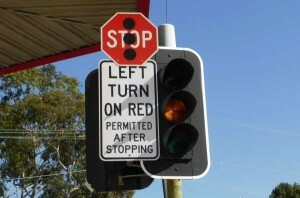 Now you've had a look through the signs, try the traffic signs test.